My birthday month (phew, I didn't think it would ever end!!) was perfectly bookmarked with a most AMAZING shipment of fiber love from Deutschland. 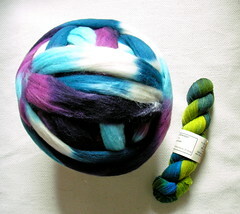 Yes, the famous blogger Elemmaciltur aka Victor sent me this dreamy roving above and another equally gorgeous roving as well. i can't describe how lovely these two specimens are (more than I have), but you'll have to take my word that they are truly spectacular. So spectacular, I see some more swaps with Victor in my future. Mostly, because my German is non-existent, but also because Victor is such a doll. As sad as it is to have my birthday month, come to an end, I have to say that I have had a most wonderful celebration. Thanks to all the lovely souls who sent me wishes, gave me presents and stuffed me with nibbles and champagne. I love you all! You deserved all that spoling and more! That is lovely roving and of course you deserve to be spoiled. heh heh. Thanks, my lovelies. Happy Flippin' Turkey Day, Mate!